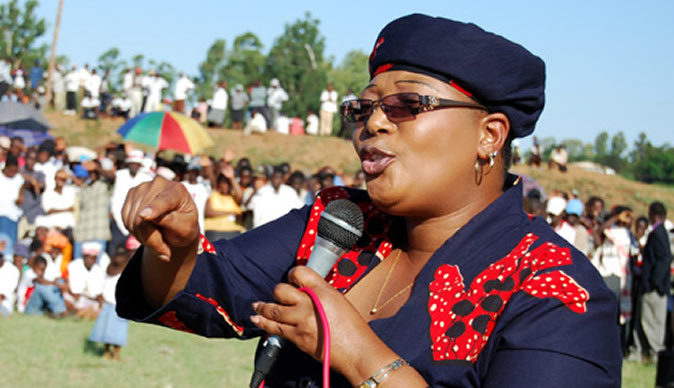 Thokozani Khupe‚ the leader of a splinter faction of the Movement for Democratic Change (MDC-T)‚ at a rally in Bulawayo on Saturday‚ officially launched the party’s election campaign and election manifesto‚ the theme of which is “Building an Economy to Support Transformation”. According to Masarira‚ the party’s manifesto does not offer wishful dreams but has realistic targets to drive the country forward. Party leader Khupe promised to address the same key issues targeted by Zanu-PF‚ but the only difference is that as an offshoot of the Zimbabwe Congress of Trade Unions [ZCTU]‚ she emphasises workers’ rights and their place in the economy. “The MDC-T is very much aware of the present weak state of the country’s economy to recover without huge external financial support. Our government shall re-engage with the international community and all progressive forces for the support the country desperately needs. We believe in the right of workers to organise and for full respect of labour rights. Our economic growth and development must be pro-people‚” she said. Political analyst Zama Mkhwananzi said buy-in on election promises made by parties depended on the audience targeted. “The kind of promises that political parties make in Zimbabwe won’t get any votes in the developed world because first and foremost‚ big promises can be a disaster for politicians. Take for example‚ Zanu-PF promised 2.2 million jobs five years ago and this year they promise 1.5 million new houses. What happened to the jobs? Perhaps Zimbabweans easily forget but I can tell you that the current Zanu-PF manifesto has been received with suspicion‚” he said. Meanwhile‚ Zanu-PF’s $200-million dollar campaign went into full swing with the first rally being the interface with the country’s veterans of the 1970s war against the colonial settlers’ regime. Zanu-PF’s secretary for administration‚ Obert Mpofu‚ told journalists that Mnangagwa would embark on nationwide “star rallies” accompanied by the party’s senior leadership. “Rallies will be held in all provinces and districts which will be addressed by senior supporters to mobilise support for the party‚” he said. Star rallies are a tradition carried over from former President Robert Mugabe’s reign. The rallies were his last rallying call before the plebiscite.